One of the main causes of tooth decay in children is poor oral hygiene. It’s important to brush and floss to remove plaque. If plaque isn’t brushed away, the acids it releases will erode the tooth’s enamel, eventually causing cavities. Have kids brush at least twice a day – or as directed by your pediatric dentist – for two minutes each brushing session using a fluoride toothpaste and floss once a day, preferably at night. You can kick off a little one’s oral hygiene routine before they even have teeth by wiping down the gums with a clean piece of gauze or a wet washcloth after feedings. As soon as they get their first tooth, begin brushing using a smear of fluoride toothpaste. Increase it to a pea-sized amount of toothpaste for kids ages three to six. When any two teeth touch, floss away! 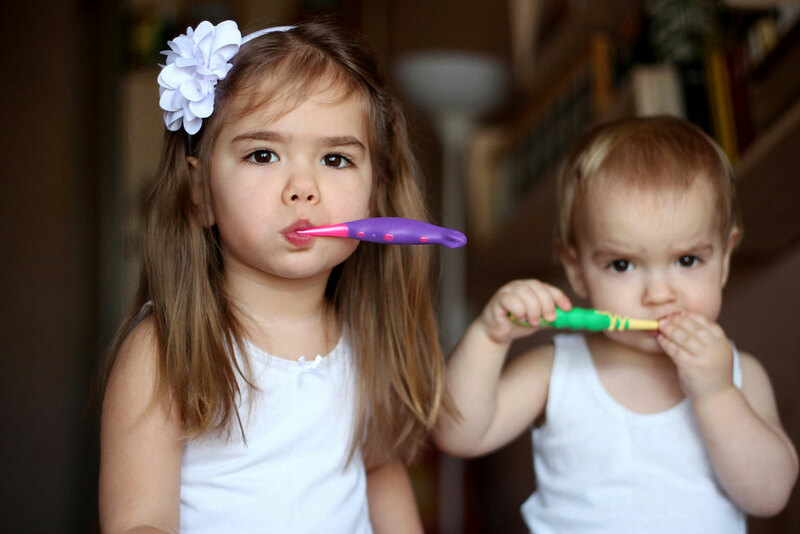 Making oral hygiene for kids really fun is one of the best resolutions for kids’ healthy teeth you can make. When little ones enjoy brushing and flossing, it makes things easier for everyone involved and they’re more likely to keep it up throughout their life. The problem is that brushing every day is kind of boring and repetitive, so your challenge is to spice things up! Brush to two-minute songs, hold brushing contests contests or dance around while you floss. The possibilities are endless but if you need inspiration, download our free guide, 12 Fun Activities to Get Your Kids to Brush Their Teeth! We love cookies and candy as much as the next person but moderation is key when it comes to sugary treats, juice and starchy foods like chips. The bacteria in the mouth feed on starches and release cavity-causing acids. Have kids rinse their mouth after eating or drinking these types of foods and limit them to special occasions. Be especially careful about foods that are sugary and sticky (we’re looking at you, raisins and gummy candy) since they tend to stay on the teeth for a longer period of time, potentially causing more damage. Instead, encourage food for healthy teeth like fresh vegetables – raw carrots and celery are great for scraping away plaque while you eat them –, calcium-rich dairy and lean proteins. Water is a smile’s BFF! When kids drink water, it washes away food debris and plaque and encourages saliva production. Saliva helps replace the minerals lost during the acid attacks from the mouth’s bacteria. It also doesn’t contain sugar or starches, so drinking water won’t increase the odds of developing cavities in toddlers or kids. In fact, you should never give a child a bottle or sippy cup with anything but water in their crib and serve predominantly water throughout the day. If you do give your child juice, stick with 100% fruit juice with no sugar added and offer it only at meals or snack time. Nearly five million teeth are knocked out every year in the United States and many of the injuries occur during sports with basketball, hockey, martial arts, boxing and football having the highest risk of dental injury. Unfortunately, many sports, including basketball, do not require that participants wear mouthguards. A key way to ensure kids’ healthy teeth is to always have them wear a mouthguard when playing sports or doing any physical activity where they could sustain a blow the face, even if it’s not in the rule books. Dental injuries are painful, costly and time-consuming to deal with. While it might seem like a child losing a baby tooth isn’t a huge deal since it will be replaced anyway, primary teeth serve a number of important functions. Losing primary teeth too early can lead to issues with crowding and can interfere with chewing and speech, so you will still have to seek out treatment. Thumb sucking and pacifier use are completely natural and perfectly fine in the first years of life, however, when they go beyond a certain point, they can cause issues with the alignment of the teeth and jaw and create the need for extensive orthodontic treatment in the teen years. We generally recommend intervening if a child is still using a pacifier or sucking on their thumb by the age of three and weaning babies from the bottle by 12 and 14 months of age. Other habits, including tongue thrusting and mouth breathing can also affect the bite. We can give you guidance on how to break the habits and keep your child’s oral development on track. We know you’re busy and you’re juggling a lot of things but making time to visit the dentist twice a year – or according to the frequency your dentist recommends – for a check-up and cleaning is well worth it. At our Naperville pediatric dental office, we keep wait times to a minimum and use advanced technology to make visits as convenient, effective and quick as possible. Plus, we have plenty of perks for kids’ entertainment like our kidzFlix Cinema and kidzCave arcade game room, so little ones will actually want to come visit us. Appointments allow us to ensure your child’s teeth, gums and jaws are developing properly, catch any issues early while they’re easy to treat and teach kids how to care for their smile. We can also give you advice on oral habits and offer preventative treatments, such as fluoride treatments and sealants. Professional cleanings are essential too for kids’ healthy teeth because we’re able to remove hardened plaque that you can’t simply brush away with a regular toothbrush. Make these resolutions for kids’ healthy teeth and gums and your child’s smile will thank you for years to come! If you’re looking for a fun, expert pediatric dentist in Naperville, schedule an appointment at Innovative Pediatric Dentistry today. We’ll help you get your year off to amazing start!